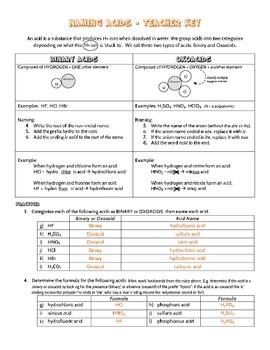 This is a one page worksheet which explains how to name simple binary and oxoacids. Students can then practice with a set of questions at the end. Teacher's answer key is provided. Please note that this is for an INTRO class on naming acids, suitable for a general high school science class or a basic level introductory chemistry class. For oxoacids, it only includes polyatomics with 'ate' or 'ite' endings. This worksheet does NOT include "per____ic" acids or or "hypo____ous" acids. (e.g. 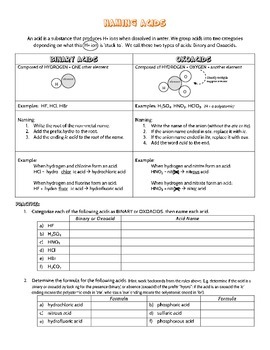 this worksheet includes acids formed from nitrate NO3 and nitrite NO2, and not the acids formed by NO4 and NO). Please see the preview file before purchasing this worksheet to ensure it suits your needs. Thank you!